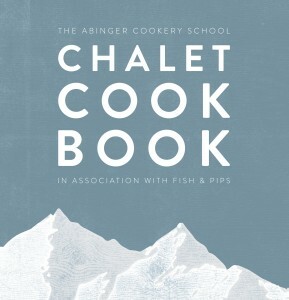 The Abinger Cookery School’s THE CHALET COOK BOOK in association with Fish&Pips is now available to order. The Chalet Cook Book will further spread the foodie love to those cooking at home and at height. It’s a must-have for seasonnaires heading out to the slopes this winter who’ll be cooking at all levels, and will make an excellent Christmas gift for adventurous home-cooks. The Chalet Cook Book is available in paperback for £10 and hard back £15. Fish&Pips and our sister company the Abinger Cookery School both come from a team of culinary enthusiasts, eager to share this passion with their guests, customers, students, and everyone we encounter along the way. With the Fish&Pips and the Abinger’s foodie credentials, it’s not surprising that a fair few recipes have stood the test of popularity and altitude. The Chalet Cook Book has been carefully compiled from a collection of absolute favourites. There’s something for everyone, from the very basics to dinner party dining to impress. And it looks very pretty too! The book will also be available to purchase in resort and from the Abinger Cookery School.